Gangotri is mostly considered as a town for Hindu Pilgrimage rather than a tourist spot. To some extent, this is correct as well but things have started to change here recently. The number of tourists arriving in Gangotri is now increasing by each passing year. There was once a time when the only tourists in Gangotri were the devotional kind. But now you will also find adventure enthusiasts and bike riders here. The Gaumukh trek from Gangotri is considered as one of the most visited ones and attracts thousands of people each year. 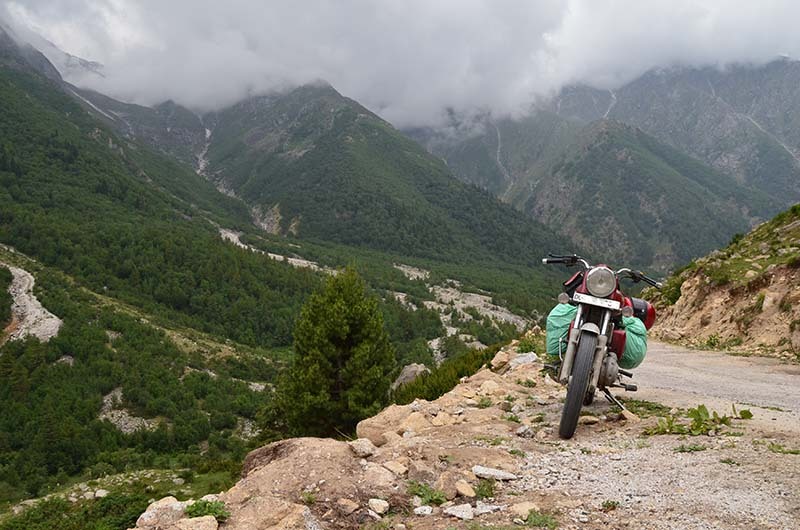 The steep climb and picturesque drive from Rishikesh to Gangotri is fast becoming a favourite among biker groups. To accommodate the increased number of visitors, new hotels and guest houses are getting erected each year. So yes, tourism in Gangotri is flourishing and it is a great spot that you can consider for your next trip. For a brief Introduction, Gangotri is a town in Uttarkashi district in the state of Uttarakhand. At an altitude of 3,100 meters, It is a major Hindu pilgrim town on the banks of the river Bhagirathi; and is known as the origin point of River Ganges. According to Hindu mythology, it was here that Goddess Ganga descended from heaven to earth; into the locks of Lord Shiva’s hair. The entire town and the local life is centered around the Gangotri temple, originally built by the Nepalese general Amar Singh Thapa in the nineteenth century. Due to its altitude and location, the town is now also a popular tourist spot. How can you plan a visit to Gangotri is what I will be discussing in this article. Let me begin by first talking a little about the mythology and the location of a few places in and around Gangotri. It will give you a little knowledge about the place; help you understand the area; and plan your trip in a much better manner. Being a pilgrimage town, there are several stories from Hindu Mythology that are related to Gangotri. The most famous and respected one, however, is of how the River Ganges was brought down to earth. The river originates from Gangotri glacier and the spot that is considered as the origin point is called Gaumukh (or Gomukh). 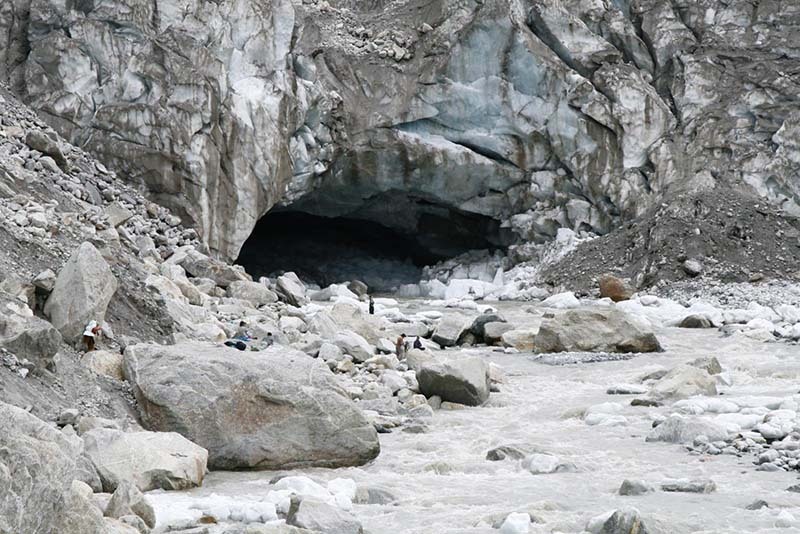 It is located about 19 kilometers from Gangotri and can only be reached by foot. The water stream that originates from Gaumukh is called River Bhagirathi that merges with Alaknanda River at Devprayag to form the river Ganga. In hydrology, Alaknanda is considered the source stream for Ganga because it is bigger in size and carries more water. However, In Hindu faith and culture, the Bhagirathi is considered the source stream of the Ganges and this is where the entire story of the origin of Ganga resides. It is said that there once lived a mighty kind called Sagar who had 60,000 sons. King Sagar once decided to perform a massive Ashwamedha Yajna, by the end of which he would have to slay his horse and all of his 60,000 sons. This Yajna, if performed correctly, was bound to make him powerful; so powerful indeed that it even got Lord Indra worried. Insecurity of losing his throne made its way in Indra’s heart and he took it upon himself to not let the Yajna be completed. The slaying of the horse was a crucial part of the ritual. So in an attempt to disrupt and ruin things for King Sagar, Indra stole his horse and hid it in a Sage Kapil’s Ashram. When King Sagar realized that his horse was missing, he assigned the duty of finding it to his 60,000 sons. A massive search took place by the end of which the horse was found. But in doing so, King’s sons interrupted Sage Kapil’s mediation and got him furious. When the sage opened his eyes in anger, all of the 60,000 sons perished immediately and turned to ash. The sage also put on a curse that their souls will not find salvation until their ashes are washed away by the heavenly river Ganga. Years passed and King Sagar died. His grandson, King Bhagirath, took over the throne and vowed to himself that he would find salvation for the souls of his 60,000 uncles. He performed deep penance and meditation to goddess Ganga asking her to descend down to earth from heaven. After years of continuous and intense penance, Ganga finally made its way to earth, granting salvation or ‘Moksha’ to the 60,000 doomed souls of King Sagar’s sons. She manifested herself in the form of a river and made way towards earth. Lord Shiva received her into his matted locks to minimize the immense impact of her fall which would have caused widespread devastation. This is why the river was named as Bhagirathi; after king Bhagirath who brought her to Earth. Ever since then people have been immersing the ashes of their departed ancestors in the waters of this holy river. Gomukh, also known as “Gaumukh” or “Gomukhi” is the terminus or snout of the Gangotri Glacier from where the Bhagirathi River originates. It is like a giant hole in the glacier with water flowing out of it. See the picture below. The name “Gomukh/Gaumukh” literally means “Mouth of a Cow.” According to the legend, the snout in ancient times looked exactly like the mouth of a cow, and hence the name. Gangotri is located in the state of Uttarakhand at a distance of about 300 kilometers from Haridwar, 280 kilometers from Rishikesh, and 500 kilometers from Delhi. Gaumukh is located a further 19 kilometers from Gangotri inside Gangotri National Park. The motorable road ends at Gangotri and the last 19 kilometers to Gaumukh can only be covered by foot. If you are a little religious then the answer to this question is an obvious one. Gangotri is a major pilgrimage town and visiting here for a trip will give you plenty of opportunities to visit temples not only in the town but also en route. The entire stretch from Haridwar to Gangotri is marked by places that are religiously important in Hinduism. For the adventurous kind, the trek from Gangotri to Gaumukh will be a great chance to walk through the wilderness while enjoying great views on the way and tracing the origins of River Ganges. On the way, you can also stop at Rishikesh to enjoy some white water rafting. Campsites too are a common site on the route. Even if you do not fall in either of these categories, a trip to Gangotri will still give you some time in peace and tranquility. You will find tourists in Gangotri but not so much that it would feel crowded like in Shimla and Manali. Visiting here during summers means pleasant weather, fewer people and mesmerizing vistas all around. Gangotri is one of those places that are very well known but still considered an offbeat destination. So if you are someone who tends to avoid crowded places then Gangotri is a perfect destination for you. A one-line answer to this question is that yes, Gangotri is very safe to visit. But much of it really is in your own hands and will get driven by the decisions you make. The road from Rishikesh to Gangotri is a 280 kilometers long drive on long winding roads of Himalayas. It gets both steep and narrow and is really bad at some places. Monsoon wreaks havoc in this area and landslides in July and August can wash away entire sections of the road. But at the same time, people here are very humble and the crime rate is almost next to none. There are several hotels here and it is a highly religious place as well. Your phone too will remain connected no matter which network you were on. So in short, as long as you drive sensibly, keep a close watch on the weather, do not take any unnecessary risks, do not wander alone in the wilderness and do not get in any altercations, Gangotri is a very safe place to visit. Reaching Gangotri is not a difficult task at all. The place is well connected by a road that remains open for the most part of the year. Depending on your own preference, you can either drive here by your own vehicle or board a Bus; or you can even rent a private taxi as well. The only time when you may not be able to reach Gangotri is during winters after it starts to snow. The road gets blocked after heavy snowfall in December, January and February; and entire Gangotri town get shut down. For the sake of explaining the route and itinerary, I will assume Delhi as the starting point. However, even if you were coming from a different city, the explanation below would still help you understand the route and plan your own itinerary. No matter where you were coming from, only the route till Rishikesh may be different, rest of the journey will still be the same (unless you were traveling from somewhere within Uttarakhand). The route of the journey will be as mentioned below. Starting from Delhi, you will first travel through the busy towns of Ghaziabad, Meerut, and Muzaffarnagar to arrive at Haridwar. Journey until here mostly be a smooth one on a well-laid highway. After Haridwar, the road gets narrow and turns into a single lane highway until Rishikesh, resulting in slow traffic. After Rishikesh, you will start driving uphill and the climb will really be a steep one. Until Chamba, the road will remain in excellent condition with a few bad patches in between and the drive will be very scenic. After Chamba though, the road will start to deteriorate and from here on, will be a mix of good, bad and ugly until Gangotri. The scenery will however still remain mesmerizing with Ganga following you throughout the journey. Traveling this way, the entire journey will be of 500 kilometers and will take you at least 18 to 20 hours to complete. This is ideally a 2 days journey with a night halt at either Rishikesh or Chamba. If you do not wish to enter Haridwar and Rishikesh, you can take an alternate route via Dehradun. Until Roorkee, you will follow the same highway via Meerut but rather than going towards Haridwar, you will reach Dehradun and drive up towards Mussorie. From Mussorie, you will then continue on the road towards Uttarkashi via Suwakholi. In terms of length and time, both these route are almost the same. Traveling this way, you can break your journey in Dehradun or Mussorie; and drive to Gangotri the next day. Public transport is available for Gangotri and is, in fact, the most common way for tourists and devotees to travel. If you want to reach Gangotri by Bus, then the first place you should plan on reaching is either Haridwar or Rishikesh. Both these places are very well connected and finding a Bus for either of the towns will not be difficult. There is a daily Bus that leaves Haridwar and Rishikesh for Gangotri which will be your next mode of travel. This bus leaves at around 6 in the morning and reaches Gangotri by evening. If you could not board this bus then you would have to break this journey in two parts. From either Haridwar or Rishikesh, you will first catch a bus for Uttarkashi which is a journey of about 6 to 7 hours. From Uttarkashi, you will then either board a Bus for Gangotri or can also find a shared taxi. There are several buses available on both these routes (Haridwar / Rishikesh to Uttarkashi and Uttarkashi to Gangotri) throughout the day so finding one will not be a problem at all. The only thing to keep in mind is that buses start from both the towns in the first half of the day. From Rishikesh, you may not find a bus for Uttarkashi after 9 PM and the same applies for Uttarkashi to Gangotri bus as well. If you were coming from Delhi, then there is a direct Bus from ISBT Delhi for Uttarkashi which you should look for. This will save you the hassle of changing Buses at Haridwar or Rishikesh. If you were traveling from Dehradun, then too you do not need to reach either Haridwar or Rishikesh. There is a direct bus from Dehradun to Uttarkashi which you can board. Assuming Delhi as the starting point, the entire journey will cost you about Rs. 1000 to Rs. 1200 as Bus fare. Delhi to Rishikesh is about Rs. 500 per person depending on the type of Bus (Volvo will cost more). Rishikesh to Uttarkashi will cost you about Rs. 300 and then another Rs. 200 for Uttarkashi to Gangotri. Shared taxis are available on the route above from both Rishikesh and Uttarkashi. The benefit with shared cabs is that they ply in the latter half of the day as well. So if you missed the Bus, you can always look for a shared cab. Travel time will be about the same but fares of shared taxis could be slightly more. You can also get shared cabs for Uttarkashi directly from Dehradun as well. Private taxis are available for Gangotri from both Rishikesh and Uttarkashi. It will cost you about Rs. 5000 from Rishikesh and about Rs. 1500 from Uttarkashi, depending on the type of cab you chose. The nearest airport to Gangotri is Jolly Grant Airport in Dehradun which is located around at the distance of 250 kilometers. Once you land in Dehradun, you can travel to Gangotri by either Bus or taxi as I explained above. The nearest railway station to Gangotri is located in Rishikesh at a distance of 243 kilometers. Once you reach Rishikesh, you can either board a Bus for Gangotri or Uttarkashi or rent a taxi as I explained above. You cannot reach Gangotri in winter. The temple is closed after Diwali and by December, the entire town is deserted as locals move to lower areas. You can visit Gangotri anytime after April but the temple is opened only in May. Due to its elevation, weather in Gangotri remains pleasant for the most part of the year. Summer here is equivalent to the spring season of the plains when the daytime temperature does not exceed 20 degrees Celsius. Winters, however, are extremely cold and the entire region receives a lot of snow in the months of January and February. The temperature at night during winter can drop several degrees below zero. The temple and most of the hotels here remain closed as people move to lower areas for a few months. Monsoon again is a time when the weather can turn extreme. The 2013 Kedarnath floods are an example of such extremity. Landslides caused by incessant rains at this time are common in this region. For more information on the topic, please read A Month by Month breakdown of Weather in Gangotri. The average temperature of Gangotri is 15° Celsius Maximum and 2° Celsius Minimum. Warm and woolen clothes are a necessity throughout the year in Gangotri. During peak winter, the temperature ranges between -10 Degrees minimum and 2 Degrees Maximum. In summer, however, the temperature remains pleasant with a minimum of 2 to 5 Degrees at night and around 15 Degrees during the day. The months from April to June are considered to be the best time to visit Gangotri. The gates of Gangotri temple open during the start of summers. Weather at this time is pleasant with clear skies and sunny days. These are also the best months for planning to visit with your family. Monsoon arrives towards the end of June and the following months of July and August are a bad time to visit Gangotri. It rains a lot here and sometimes enough to keep you indoors in the hotel throughout the duration of your trip. If the weather turned extreme, landslides can keep the roads closed for several days. But if you are ready to take the risk, the scenery at this time is at its best with beautiful lush green vistas all around. September again is among the best months. Monsoon would have passed but all the greenery would still be there. In a way, September offers all that monsoon has to offer but without the risk of any rain. October is the month of Autumn and all that was green turns golden orange at this time. November overall is a bad month to go because the vistas at this time are dry and dull. Weather will be very cold and there won’t even be any snow around. So for a family trip, April, May, and June are best. For photography, September and October will be a good time. If rain makes you uncomfortable, you should avoid July and August. If cold is not your cup of tea, do not go between October to March. For enjoying some rafting as well, plan in either April or May. What clothes to pack for Gangotri will depend on the month you arrived here in. From November to March you cannot reach Gangotri at all. For traveling in April and October, you should pack heavy woolens and a warm windproof jacket. Ensure that your jacket also has a hood to protect your head and face. Thermals too will be required at this time, especially for the lower part of the body (something that you can wear under your trousers). Warms Gloves and socks will also be a must for a trip in these months. For traveling in May, June, and September, pack some light woolens and a heavy windproof jacket. If you were visiting in July or August, you should bring clothes that can dry faster; like polyester. Irrespective of the time of your travel, gloves, warm socks, caps, and a heavy jacket will be a must. Below are some of the other necessary items that you should be packing for this trip. Trekking shoes (recommended for trek) or Shoes with good grip. I have actually covered this topic in details in a different article but for a quick overview, below is a list of places of tourist interest in Gangotri. Apart from visiting all of the above-mentioned places, the two other things to do in Gangotri would be trekking and camping. The 17 kilometers trek from Gangotri to Gaumukh is among the favorite ones located in Uttarakhand and can easily be completed in 2 days. Some other treks that you can venture upon are towards Dayara Bugyal, Kedartal, and Dodital. While the trek to Gaumukh can be done on your own, please make sure that you are hiring a local guide and making proper arrangements for the other ones. These are not just some casual treks that you can venture upon. All these treks will take some planning and are a few days affair. I did not notice any campsites in Gangotri but there was one in Harsil. If you went trekking then overnight stays during all these treks will be in camps. There are a few hotels in Gangotri and you will have no trouble finding one as per your taste. Gangotri receives a lot of pilgrims and devotees due to which, budget hotels also are available here. Whether or not to book in advance will depend on your time of arrival. If you were reaching here during Yatra season then I will strongly recommend that you book and confirm your stay before starting from home. This will be more applicable towards the month of May and during Kanwar Yatra. Gangotri at both these times gets a little crowded and without booking, you may struggle to find a place to stay for the night. For budget travelers, the GMVN tourist lodge will be a great choice. Please note that all these hotels shut down during the winter season and only remain open from May till October. I noticed one campsite in Harsil, above 25 kilometers before Gangotri, but I did not find a campsite in Gangotri itself. The arrangement for a campsite can, however, be made on request by any of the local tour or trek organizers. There is no Bank or ATM in Gangotri. The nearest one is located in Harsil. There is no fuel station in Gangotri. The nearest one is located in Uttarkashi, about 100 kilometers away. There are no mechanics available in Gangotri. You can find some help in Harsil but do not really count on it. The only place where you will definitely find a mechanic is Uttarkashi. There is a government hospital in Harsil which will be the nearest medical assistance available. A larger and better hospital would be in Uttarkashi. I would strongly suggest that you bring some basic medicines along; like for cold, fever, flu, stomach ache, headache, etc. BSNL has the best mobile network in Gangotri followed by Airtel. If you were carrying a BSNL phone, you will have network even for a couple for kilometers on the trek towards Gaumukh. There is electricity available in all the hotels in Gangotri. Every basic facility that you will need as a tourist will get provided. Gangotri is a known tourist destination and the hotels here are well equipped to receive a large number of tourists and pilgrims. Starting from Delhi, the road remains in excellent condition until Haridwar after which, it turns into a single lane highway till Rishikesh. Though the condition of the road will be good; but it may get narrow and crowded at some places. You will start driving uphill after Rishikesh but the road will remain good still till Chamba. After Chamba however, it starts to deteriorate a little and can get extremely bad at some places. During monsoon, rain can really do some damage on the roads here. You can drive to Gangotri by any vehicle as long as it is well maintained. I have in fact seen the locals here drive around in a Maruti 800 or Alto. There are only two things that you need to take care of. First one is that your vehicle is well serviced and ready to handle the steep climb. Second is that during monsoon season, there could be a lot of slush on the way; so a car with high ground clearance will preferably be better. In terms of a motorcycle, you can plan your trip even on a 125 CC bike but if you were doing that, it would be better to ride as light as possible and solo. Being a Hindu pilgrimage town, the majority of the population in Gangotri are Hindu priests or Brahmins. There is also a fair amount of Nepali people here looking for job opportunities as guides and porters. The livelihood of the locals here depends almost entirely upon pilgrimage and tourism. Hotels, Dhabas, tea stalls, small shops selling items of religious value or souvenirs; and helping pilgrims with performing religious rituals is how the people here make a living. Hindi is the most commonly spoken language and understood by all in Gangotri. Locals also speak Garhwali and Kumaoni dialects. Some people related to tourism industry can speak a little bit of English as well. Gangotri is just a tiny town and you do not need local transport to move within. Porters are available to carry your luggage if you intended to go on a few days of trekking. There is no special dish as such that is specific to Gangotri but you will find simple north Indian dishes available here. Some hotels can serve south Indian and continental food as well. You can either eat at your own hotel or the small dhabas. There is no shopping option here really. It is just a tiny village that is religiously important and popular among trekkers. So most of the items you can find here are small trinkets of religious significance. Yes, it snows in Gangotri from December to March. Gangotri remains open from May till October. The town may get opened in April but the temple doors are opened only in May and closed after Diwali. This will entirely depend upon where you were coming from and what was your mode of travel. But assuming Delhi as the starting point, I will recommend a minimum of 5 days for visiting Gangotri. If you were coming from Delhi, then below is how you can plan your journey. If you had 6 days in Hand, then you can travel like this. If you can add one more day, then you can do some sightseeing n Gangotri as well. That will mostly be all that you need to know about planning a trip to Gangotri. It is a greatly scenic, peaceful and charming destination that definitely deserves a visit. I hope the information above was of help. If you have any questions; or need any other details; please feel free to ask in the comments section below; or at our Community Forum; and I will be glad to answer.